Memorial Day is soon to be upon us, which is so important to take the time to remember those who have served for our country and be with loved ones. Each year, my family has a get together on the beach and this year we even rented a condo for the 3-day weekend. Family gatherings always come with food, so of course I took on the role of creating dessert for everyone! The wheels in my head started to turn when thinking of a fun and festive dessert to create for the family. I obviously wanted to incorporate red, white, and blue, which immediately made me think of berries. In my opinion, berries always go great with lemon; a light flavor and perfect for summer. 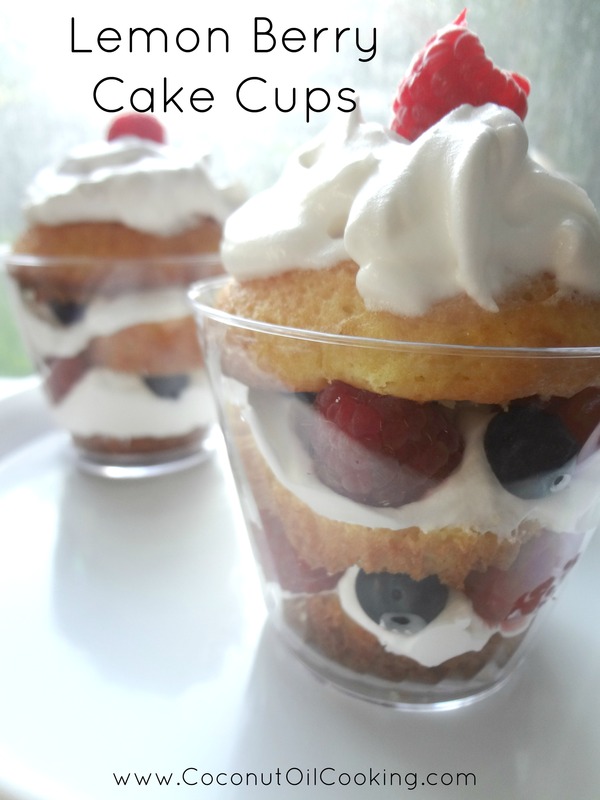 This is when the idea of a layered cake cup (yes I said cake cup) came to mind – perfect! Instead of having a traditional cake or cupcake, all of the ingredients will be layered into a clear up and served with a spoon. By doing so, you get such a nice visual of the cake, whipped cream, and berries all in one. Now for this recipe, I did use a box cake mix, however feel free to use a recipe that you have for a cake from scratch. Preheat oven to 350 degrees. Make lemon cake according to box directions and set better aside. Line a cupcake pan with liners and spray with Kelapo Coconut Oil Cooking Spray. Pour batter into cupcake pan and bake for allotted time. Once finished, let cupcakes cool and prepare to start layering. First, take 1 cupcake and cut off the top. Next, cut the remaining bottom piece in half to have 2 pieces. Place the first piece on the bottom of the cup. Next, spoon in whipped cream and top with raspberries and blueberries. Add on the second layer of cake, and repeat with whipped cream and berries. 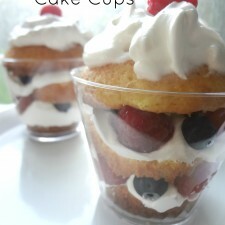 Top the full cupcake top with whipped cream and garnish with a berry. Chill until serving and enjoy! Now when layering your cake cups, you definitely don’t have to follow my exact pattern. Feel free to just do layers of whipped cream and berries on top, or alternate the berries, it’s totally up to you! Be creative with these – that’s the fun part. For more ways to use coconut oil this memorial day, be sure to head over to this blog. Have fun this weekend!